Here are some basic terms used when describing spotting scopes. Optical excellence. We all love bright, high-contrast images with true-to-life colors. Birders also appreciate rugged construction and optics well sealed from dust and weather — preferably nitrogen-filled so they won't fog up. An earlier version of this article, by Michael and Diane Porter, appeared in Bird Watcher's Digest, July, 2000. It has been revised and updated here. The first piece of equipment a beginning birder needs is a decent pair of binoculars. Then, if you want to take it another step, it may be time to get a scope. A scope is bigger and heavier than binoculars. You can't wear it around your neck, and you need a tripod to stabilize it. But it sure is nice to be able to magnify that eagle across the river 20 or even 60 fold. 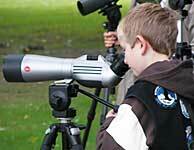 Here are some suggestions on good spotting scopes for birdwatchers. The scopes range from the least expensive you can get away with to the best in the world. See the Scopes Advisor, by Michael and Diane Porter. Or if you are a bit mystified by scopes terminology, see Scopes Basics, for an explanation of the special terminology used for scopes.